I hope everyone knew it wasn’t sustainable. Matthew Stafford’s late-game heroics always entertain us, and eight times last season actually brought the Lions a win. But it was never going to be sustainable. We’re seeing that already this year through six games. It’s called regression to the mean. If the Lions are going to be serious contenders, they need to win games from start to finish, and do it consistently. This Sunday’s game against New Orleans is the latest example of a team that digs itself a huge hole, then climbs back when the opposing defenses lay off the gas pedal. While Stafford and company should be applauded for not giving up in those situations, it’s concerning that they have to do this every single week. In the Lions’ three losses this season, they’ve been outscored 95-57 in the first three quarters, then outscored their opponents 31-14 in the fourth quarter. Maybe last year those are wins, but those last-second comebacks that seemed to fall in Detroit’s favor are now stalling out, and the Lions are 3-3. If this year is going to be different, if the Lions are going to win the NFC North for the first time since 1993, then they need to show up in the first three quarters. Being a “good fourth quarter team” isn’t going to take this team farther than another first-round exit in the playoffs. If that’s ok with you, then sit back and watch Stafford chuck the ball around when he’s down 21 and see what happens. If you look at the consistently good teams, the Super Bowl winning teams, they have occasional fourth quarter comebacks, but they don’t live off them like the Lions do. Until that changes, they’ll never be a Super Bowl contender. Don’t get me wrong, cutting a 35-point deficit to seven like the Lions did Sunday against the Saints is impressive, but good teams wouldn’t have been down 35 points in the first place. Regardless of how healthy Stafford really is, that should never happen. So what’s the problem in the first three quarters? Good question. Right now, the Lions have a paper-thin offensive line that limits the plays offensive coordinator Jim Bob Cooter can call. Stafford usually doesn’t have enough time in the pocket to let deep plays develop. The calls get conservative, the offense stagnates, and the Lions fall behind. Stafford gets beat up in the process. 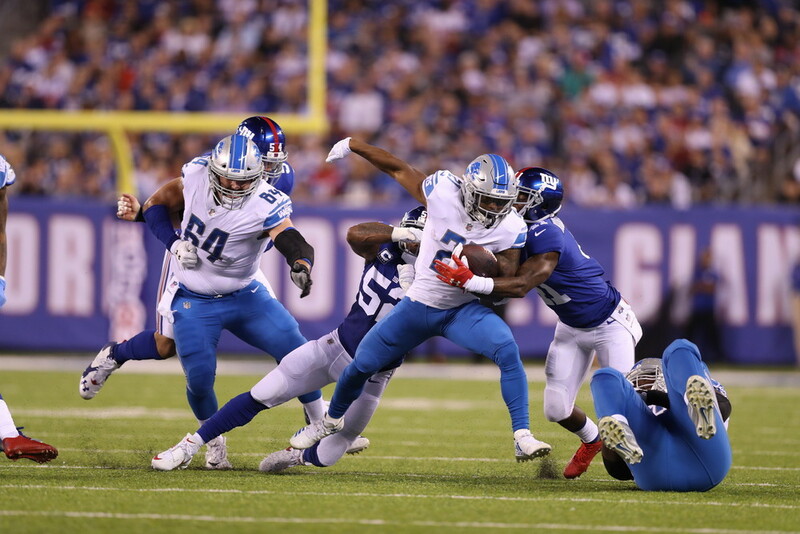 In the fourth quarter, when opposing teams have the lead on the Lions, the defenses get more conservative and bring less pressure in hopes of avoiding the big play. This allows Stafford more time to throw, the offense gets aggressive, and points start racking up. If the Lions can have a fourth quarter mentality all game, maybe they can be a Super Bowl contender. Maybe. Part of this will (hopefully) be fixed when left tackle Taylor Decker recovers from his shoulder injury, because Greg Robinson is atrocious. Plain and simple. Getting rookie wide receiver Kenny Golladay back should also open things up for Stafford. Don’t bury the Lions just yet, even if it sounds like I just did. The bye week comes at a perfect time. Stafford has the week off to recover from his high ankle sprain and whatever else he’s dealing with, the offensive line can heal up, Golladay can come back, and maybe things can go back to how they looked earlier in the season. The NFC North is wiiiiiiide open with the possible season-ending injury to the Packers’ Aaron Rodgers. The four quarterbacks in the division are now Brett Hundley, Case Keenum, Mitchell Trubisky, and Matthew Stafford. Advantage Lions. Maybe Jim Caldwell and Jim Bob Cooter will spend the next two weeks trying to dissect the first half woes better than I can, and stop relying on the comebacks to sustain their season. Because they won’t. And the Lions will only break your heart once again if things don’t change.